Marrakech---Known for his courage and sense of adventure, Kuwaiti filmmaker Walid al-Awadi is a man who knows a great deal about disaster and tragedy. 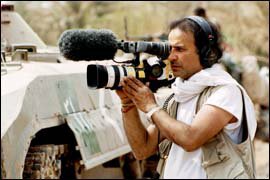 Al-Awadi is not a journalist as many think, but rather a brave director who is no stranger to documenting the human spirit in times of conflict. Walid al-Awadi's “A Moment in Time”, “Dreams Without Sleep”, "Silence of the Volcanoes" and “See you in Baghdad”, all recount stories of people affected by War or terrorism. The Kuwaiti filmmaker has shared 'a moment in time' with Morocco Times in Marrakech, discussing his films, future projects and his view of Arab cinema. Al-Awadi, who is charmed by Morocco's red city (Marrakech), couldn't attend the first Marrakech International Film Festival (2001) as he was shooting his film “Dreams Without Sleep”, which describes the life of people affected by the atrocities of 9/11. This time, albeit busy with his new film “See you in Baghdad”, al-Awadi could not resist coming to the festival to meet other film directors such as Martin Scorsese and Abbas Kiarostami, and to visit Morocco's new Hollywood', Ouarzazate. The Marrakech International Film Festival was held on Nov 11-19 in the Moroccan southern city. It has attracted a fair smattering of European and Asian stars, including Catherine Deneuve, Judi Dench, Terence Stamp, Daniel Day-Lewis, Monica Bellucci, Yash Chopra, Martin Scorsese, Vincent Cassel, Maggie Cheung and Rebecca Miller. “There is magic and huge potential for future projects in Morocco. That's why many Hollywood directors came to shoot here, particularly in Ouarzazate,” al-Awadi told Morocco Times. Al-Awadi, who has had no previous contact with North African cinema professionals, expressed his willingness to exchange expertise with Moroccan directors. “The Marrakech Film Festival was an opportunity for exchange and networking with Moroccan actors and film directors. I have met Nabil Ayouch and I was so much impressed by his film Ali Zaoua,” al-Awadi told Morocco Times. “I have no idea about Moroccan cinema, and I came here to learn about it,” he added. Al-Awadi said “he is so keen to shoot in Ouarzazate and that the southern Moroccan city, which attracted many Hollywood directors, could become one day an Arab “Ouarzahood”. As to the Arab film industry, al-Awadi said there is no real cinema industry in the MENA region. “When we talk about film industry in the Arab world, we mainly refer to Egyptian or Iranian cinema, with a little mention to the Syrian, Moroccan or Tunisian one. As to the Golf, we are more TV-oriented countries. So there is no real cinema,” he stressed. “When you go to any cinema theatre in the world, you see a huge concentration of Hollywood or bollywood movies subtitled to different languages. That shows that these cinema professionals know how to talk to the rest of the world,” he explained. Al-Awadi dreams to see an Arab cinema that can be well represented in the other side of the world. The 36-year old Kuwaiti director had its debut in the 1990's. After working with widely acclaimed German documentary director Werner Herzog, Al-Awadi began to document his own stories. His first film, "A Moment in Time," is a true account from the Persian Gulf War. Released in 1995, the documentary played in film festivals worldwide, and won awards from both the Houston and Ohio International Film Festivals. Al-Awadi, who divides his time between Kuwait, Los Angeles, London, and New York, told Morocco Times that 'A Moment in Time' with American actor Robert Guillaume was a turning point in his life. “That film changed my life. I was in Kuwait during the Iraqi invasion in 1990 and I worked with the underground resistance groups for 7 months. Since then, I became more known in the region as a serious young filmmaker from Kuwait,” he said. Al-Awadi added that since then, he decided to be a full time filmmaker. In 1996, he graduated from New York Cinema Academy with a degree in cinema production. He continued to reveal stories from the Gulf in his 1997 film, "Silence of the Volcanoes", a documentary on Kuwaiti prisoners of war held in Iraq. in "A Call From Kuwait," which won an award at the Chicago Film Festival. In 2000 al-Awadi made his first feature film "Sedra”, which was shot entirely in Kuwait. It was nominated for best film at the Sienna International Film Festival. In 2001, al-Awadi made "Dreams without sleep", which documents the life of people affected directly or indirectly by the World Trade Center attacks. In this documentary, al-Awadi sets out to weave a story of immigration, family history, and the meaning of the American dream through the narratives of five New Yorkers affected by the September 11 tragedy. “On September 10, 2001, I was in Washington DC meeting with Pentagon officials to discuss possibilities of helping me on my film about the Golf War. I had to go to NYC that night for some other meetings, and due to bad weather, my plane was delayed. I arrived so late in NY that I went right to my hotel. At 8:00am, I left the hotel and went down to Canal St. I obviously realized that something big happened. I had my video camera with me and began filming, with no reason as to why, just that I needed to do it,” al-Awadi explained as he was recounting the atrocities of 9/11. “I wish I could describe what I saw. But, only I could tell you the feeling was not new. It was as if my country was being invaded again, my people being slaughtered, my freedom taken. It reminded me of the invasion of Iraq. The exact feeling of being unable to control the surroundings, feeling like my life and liberty were being taken away without my permission again,” he added. Through his film, al-Awadi said he wanted to explore why people come to New York and to juxtapose this with the emotions of 9/11. He said that as an Arab and Muslim and admirer of New York, he felt compelled to make a film "about hope and peace and bringing different cultures together". "New York is the only city in the world that has all kinds of religions, backgrounds, ethnicities, colours. No one cares where you come from because there is opportunity for every single individual if they want to make it," he said. Al-Awadi told Morocco Times that doing projects between 1995 and 2001 and working with John Alonzo, a famous director of photography back at Hollywood, he was able to see another side of filmmaking and learned how to work internationally and look at things in a very different way. The Kuwaiti director is founder and Chief Executive Officer for Image Media Productions, a multimedia company based in Kuwait. Since 1997, Image Media has offered web design and architecture, as well as feature film and commercial production services. Al-Awadi is about to finish his new film “See you in Baghdad”. "When I rang the Pentagon and told them about my idea to make a film in Iraq, the guys said, 'Why? Do you want to die? I said it would be very hard for me as a filmmaker to watch the war on TV, and that I'd be the happiest man to be at the very front line and make a film about the change in Iraq." But they would not help him, telling Awadi he was crazy. Eventually, when Fox News offered him one of their embedded spots, the Defense Department relented. Soon after, he received news that his unit would be the first to push through to Baghdad. "I thought: Wow. How could I be any luckier than this? I will be with the unit that frees Baghdad," he said. "But how could I have any worse luck? I was also going to be the first to die." While re-thinking his focus, it emerged that there was a married lieutenant couple and a set of twins in neighbouring units, including his own. That touched off his idea to paint a story of love and companionship in the midst of war. His portrait of these four characters, along with himself and his cameraman, was laced with plenty of trauma. "War is ugly," he said. "I saw a young girl carrying her fingers in the middle of the road while her father was dying." Awadi recounts other horror stories. He manages this despite shooting footage of a commander in his unit dying, and of his cameraman wincing in a pool of blood after being sprayed with shrapnel. Walid al-Awadi is not a journalist, but a brave filmmaker who has “dreams without sleep” and who shared pain and anguish with friends and families who are lost because of terrorism and war, a humanist before all who wants to see the world a better place to live, a world of peace and harmony. Al-Awadi is currently the CEO of a new film production company called Desert Door Production (DDP). His USD 15-million business aims at developing the Arab cinema and produce quality films by supporting Arab directors and scriptwriters produce their film projects. He has recently invited Arab filmmakers to cooperate with DDP and benefit from the company's financial support. The latter will soon open a new office in Dubai media city.